Copyleft is a play on the word copyright and a specific condition that the user will be able to copy it freely while distributing software, examine and modify the source code, and redistribute the software to others as long as the redistributed software is passed along with the copyleft stipulation too.The principle in copyleft is that, one benefits freely from the work of others but any modifications one makes must be released under agreeable terms. Under fair use, however, the copyleft license may be superseded, just like regular copyrights. Therefore, any person utilizing a copyleft-licensed source for their own work is free to choose any other license provided according to the fair use standard. Another characteristic of copyleft is that, it reflects the belief that freer redistribution and modification of software would encourage users to make improvements to it. Several types of open source software licenses are distinguished as having copyleft elements. The difference between the open source movement and the free software movement hinges on the debate over whether derived works should be subject to the same type of licenses as the works they were derived from, a key component of the copyleft ideology. To the extent that a copyleft license achieves the goals of this ideology, a license is labeled as strong or weak copyleft. The GNU General Public License is considered an example of the former, and the Mozilla Public License an example of the latter. Copyleft licenses may be distinguished as full or partial copyleft, depending on how much of a work is covered by the license, and to what extent. Some copyleft licenses are called share-alike copyleft. The Share Alike aspect requires all offshoots of a work to be licensed unde r the same (or a compatible) license as the original. These licenses are sometimes defined as “some rights reserved,” as opposed to the “all rights reserved” of copyright and the “all wrongs reversed” of copyleft. Tiny BASIC , a modified version of Microsoft’s (then “Micro-Soft”) BASIC that could run on 2 to 3 kilobytes of memory, famous for first prompting an irate letter from Bill Gates which reflects many of the same concerns that intellectual property owners express today in light of easy, digital file sharing. In a pattern that reflected open source values before “open source” was a thing, Tiny BASIC was then modified by Li-Chen Wang for the Intel 8080 microprocessor, and subsequently by hobbyist Roger Rauskolb who first added a “copyleft” notice to the program’s identity disc. Later, programmer Richard Stallman provided a version of a computer program he was working on to a private company and upon requesting the changes made, the company refused. In retaliation, Stallman created the first copyleft license in 1983 which would ultimately become the GNU General Public License His aim was to develop a complete free operating system.GNU General Public License, a legal construct that included a copyright notice but added to it its terms the freedoms of reuse, modification and reproduction of a work or its derivatives to be kept for everyone. Mozilla’s Firefox web browser, the Open Officesuite of productivity tools, and the GNU/Linux operating system. In addition to those, the whole Wikipedia websiteis copylefted, including the source code of the operating system that runs the server, the webserver software itself, the programs that create the webpages, and the content of the webpages. the freedom to modify the work, and the freedom to distribute modified and therefore derivative works. These freedoms do not ensure that a deriavative work will be distributed under the same liberal terms. In order for the work to be truly copyleft, the license has to ensurethat the author of a derived work can only distribute such works under the same or equivalent license. In addition, copyleft licenses address other possible impediments. These include ensuring the rights cannot be later revokedand requiring the work and its derivatives to be provided in a form that facilitates modification. In software, this requires that the source codeof the derived work is made available together with the software itself. 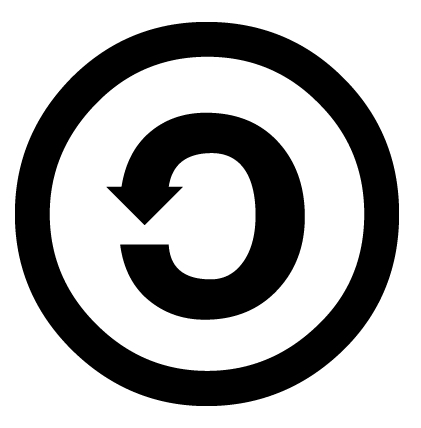 As a conclusion, copyleft contains the normal copyright statement, asserting ownership and identification of the author. However, it then gives away some of the other rights implicit in the normal copyright: it says that not only are you free to redistribute this work, but you are also free to change the work. However, you cannot claim to have written the original work, nor can you claim that these changes were created by someone else. Finally, all derivative works must also be placed under these terms. With computers, copies of a digital work can easily be made and even modified, or distributed by others, the same as the original work. As long as we live in a world with a legal system where legal abstractions such as copyright are necessary, as responsible artists or scientists we will need the formal legal abstractions of copyleft that ensure our freedom and the freedom of others.